Book is in Near Fine condition; jacket has a chipped head of spine and a tear at bottom edge. Text pristine. What was it like to watch the Wright Brothers soar into the sky? To hear the first crackling voice aired on the radio? To cower in the ghastly trenches of Europe during World War I? To lose everything in the stock-market crash of 1929, or experience the birth of rock and roll? To watch the Berlin Wall divide East and West, and then, twenty-eight years later, to see it fall under the weight of tens of thousands seeking to taste freedom? For the past seven years, researchers, reporters, and producers for ABC News have searched the world's archives for the rarest and most stunning photographs and images, consulted eminent twentieth-century historians, and discovered and interviewed hundreds of eyewitnesses and participants in the significant moments of the most eventful one hundred years in human history. The result is this spectacular book, the independent companion volume to the landmark ABC News and The History Channel television series "The Century." 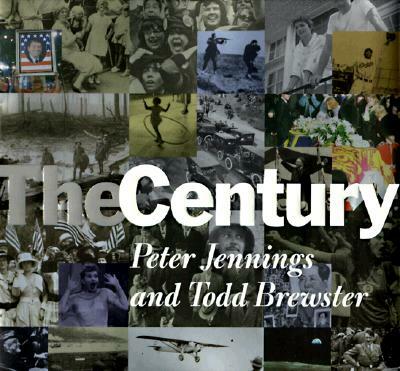 Co-written by ABC News Anchor Peter Jennings and Senior Editorial Producer Todd Brewster, "The Century" features a narrative of extraordinary quality that tracks major themes--the impact of technology, the soaring of the imagination, the ghastly violence, the joy of entertainment--through chronological chapters recounting the signal moments of each era in the century. From "Seeds of Change: 1901-1914" to "Machine Dreams: 1990-1999," each chapter is threaded through with fascinating first-person accounts of the great events of the twentieth century, and illustrated with over five hundred color and black-and-white photographs (many never published before) reproduced in exquisite depth and clarity. "The Century" presents history as itwas lived, and as it will be remembered for the next hundred years. Here is a keepsake volume destined to be an essential part of every family's library: an epic journey through the last hundred years, whose heroes are our grandparents, our parents, ourselves.